Music: Joni Mitchell, Ladies of the Canyon. This album was released just after Joni won her first Grammy and contains the popular songs, Big Yellow Taxi and Woodstock. Great album. One pot meal with endless possibilities for meat and veggie combos. It’s different: it’s not pasta or a casserole. Face it, it’s fancy…oh so fancy. It’s cheap. I get Arborio rice for $3.99/lb. in the bulk section and I use better than bouillon for the chicken stock, which combines with plain ol’ tap water. That means the only thing costing you much is whatever you put into the risotto. That was deep, BJ, but true. If you are feeling like you need to cook and just stand at the stove top for a while, risotto is what you need to make. It’s not high maintenance, but it requires a little love. 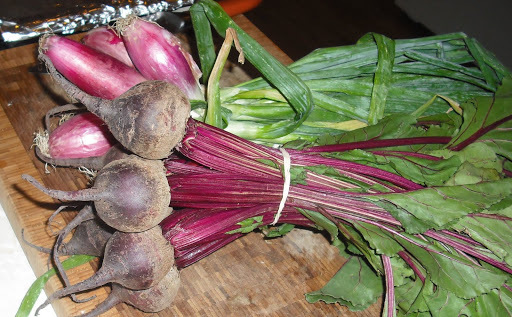 Another recent obsession has been finding a good beet recipe (a good one here and an okay one here). I think I have finally found my favorite beet recipe, as well as the best way to prepare them. A lot of recipe call for roasting the beets whole and peeling and dicing them after wards, which leaves your kitchen looking like a murder scene, really. 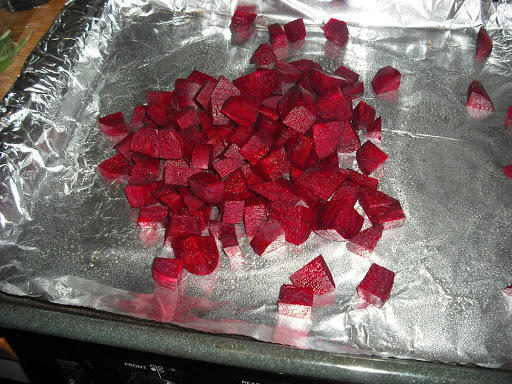 So, what’s worked for me is peeling and dicing the beets prior to roasting. First, it cuts the cooking time down by almost half; and second, it’s a little easier clean up. I got the idea from this article. 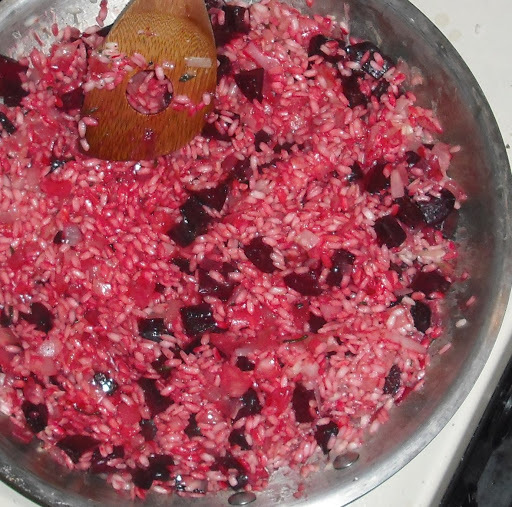 Red risotto. 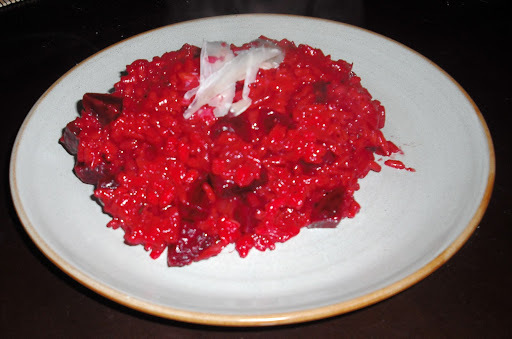 Really red risotto. On a foiled, greased baking sheet toss diced beets with EVOO and S & P. Drizzle the four shallot halves with EVOO and lightly S & P. Roast beets and shallot for 15 – 20 minutes, until shallots are lightly browned and beets are fork tender. Chop shallots and set aside. In a large skillet, heat more EVOO. Saute onion and chopped shallots until translucent. Add roasted shallots, garlic and seasonings. Saute another 1 – 2 minutes until combined. Add rice to pan and cook for a good 2 minutes. The rice will become opaque and smell slightly nutty. Deglaze the pan with the wine, scraping up any brown bits on the bottom of the pan. Let the wine cook down until no liquid is left. Add about 1 – 1 1/2 cups of chicken stock and let the liquid cook down, stirring once in a while. Continue adding chicken stock after each previous addition cooks down. 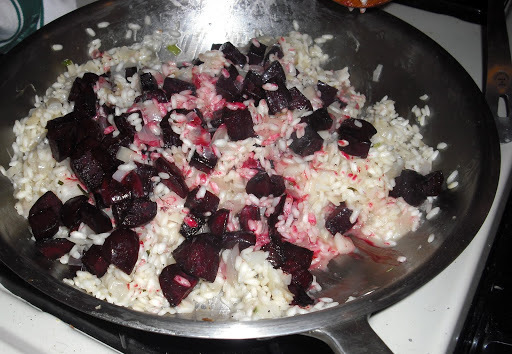 After the chicken stock is almost out and rice is almost done, add beets to pan. Stir to combine and continue adding chicken stock until rice is tender and done. Turn off heat and add cheese. Stir to combine and serve! This entry was posted in risotto by callywoodfarms. Bookmark the permalink.